In a food processor(or a medium bowl, combine flour (1) and salt for crust. Pulse or cut in butter. Once butter is mostly into small chunks, pulse (or cut) in cream cheese. Once butter and cream cheese are in pea size pieces, pulse in 1/4 cup of water (2) until dough begins to come together, adding a 1 tablespoon of water extra as needed(3). Remove from food processor and shape into a disc without handling the dough too much (4). Wrap in plastic and place in refrigerator. While dough chills, peel butternut squash and cut in 1/4″ thick slices (5). Place on a baking tray (covered with parchment you want) and roast until tender, roughly 20-25 minutes. To make onions, cut into 1/8″ half circles (6). Heat over low the olive oil in a skillet. Place sliced onions in skillet and begin to let onions cook- do not stir. Continue to cook onions until they begin to brown, 10-15 minutes. Once onions are cooked, stir in balsamic vinegar and continue to cook until vinegar reduces down, about 5-10 minutes (8). Once dough is chilled, squash is roasted, and onions are ready, blend together the remaining filling ingredients (7). On a lightly floured surface, roll the pie dough out to a 12-14″ circle (9) and transfer to a baking sheet covered in parchment paper. Spread the ricotta filling evenly over the pie crust, leaving a 2″ border around the edge (10). Next, evenly sprinkle 3/4 of the balsamic onions over the ricotta mixture (11). Finally, start in the middle and overlap the butternut squash in a circle continuing until all the ricotta mixture is covered (12). Fold over the edges of the crust, pleating as needed to make and even circle (13). Combine the egg yolk/water and brush the outer edge of the crust (14). Drizzle olive oil on top of the butternut squash and place in oven (15). Bake galette until crust is golden brown and the cheese has puffed- somewhere between 35-45 minutes. Remove from oven and sprinkle with remaining balsamic onions. Cut into wedges and serve. See corresponding step by step photos below. + Look for veg friendly parmesan as most parmesan is not made with vegetarian rennet. If you can’t find it, skip. 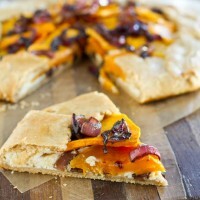 + For serving, this squash galette is great hot, room temp, or even straight from the refrigerator as leftovers.